A year ago I was attending Glastonbury festival. I was exploring the festival and everything it had to offer. I thoroughly enjoyed the music side of the festival and seeing bands such as Mumford & Sons was incredibly special but, in typical form, I found myself spending hours on end in the cinema tent. As it’s been almost a year since I sat in the mud and grass, resting my head on a tent pole to avoid neck ache, I thought I’d recap on the films I watched there and discuss what it was about that tent that I found so comforting and addictive. Here are just some of the films I watched there. This independent British comedy was a surprise screening, as it was scheduled quite spontaneously. I knew nothing about it and was very impressed by it. It was incredibly dark and yet so very funny. Films such as this gem by Richard Harrison would go unseen by so many if it was not for cinema tents such as the Pilton Palais or other screenings at film festivals. Here, in the Pilton Palais, I was allowed to watch the work of British writers and directors for absolutely no charge. This short film by Spike Jonze was created to coincide with The Suburbs, the third official album from the band ‘Arcade Fire’. As a fan of the album, I felt the warmth and tragedy of the album reflect in the film. It is a haunting and brave piece of work that deserves the critical acclaim that it received. I was very pleased to be given the opportunity to watch a film like this on a huge screen, in all of its glory. This is possibly the best film I saw at Glastonbury. It was not necessarily the bestmade film, but I had the best experience whilst watching it. Starting at 2am, the film was greeted to cheers and whistles from an excited audience who had waited as long as I had for this gory piece of work. It was so much fun. 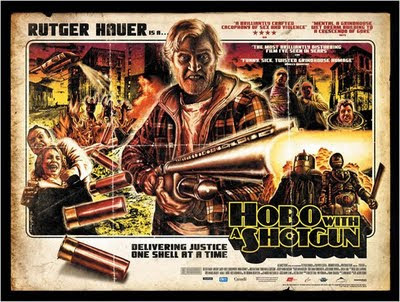 A film filled with blood, guts and death,Hobo with a Shotgun provoked such an astounding reaction from the crowd that I really felt part of something unique. I doubt I will ever have so much fun watching a film in the cinema ever again. This worrying documentary from Lucy Walker was something I did not expect to get a chance to see. I was very glad that around all of the family screenings, comedies and late night horrors the organisers of the cinema had managed to schedule a screening of something this educational, serious and challenging. 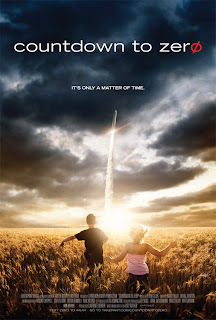 A very intense film that drags you into the chaos of the nuclear arms race and reconfirms all the fears that were originally felt in the nineteen fifties. A very well articulated piece of work that I was very pleased to have witnessed. A heart-warming tale of love and loss, Submarine was a true delight. With a beautiful soundtrack and the most quick-witted and dry sense of humour running through the narrative, I warmed to this movie more and more as it played on. With stunning central performances from two very young actors and great characterisation from Sally Hawkins and Paddy Considine, this coming of age tale really struck me as being incredibly poignant. Besides the films I watched there, it was the tent itself that I enjoyed being a part of. The atmosphere was electric, particular at late night viewings. Being with other cinema fanatics in such an open space made me feel oddly content. I felt at peace in that tent. Laughing, crying and becoming completely engrossed with everybody else. I can not wait to return next year. Tags: Festival, film, Glastonbury. Bookmark the permalink. Previous post ← …In a Day.